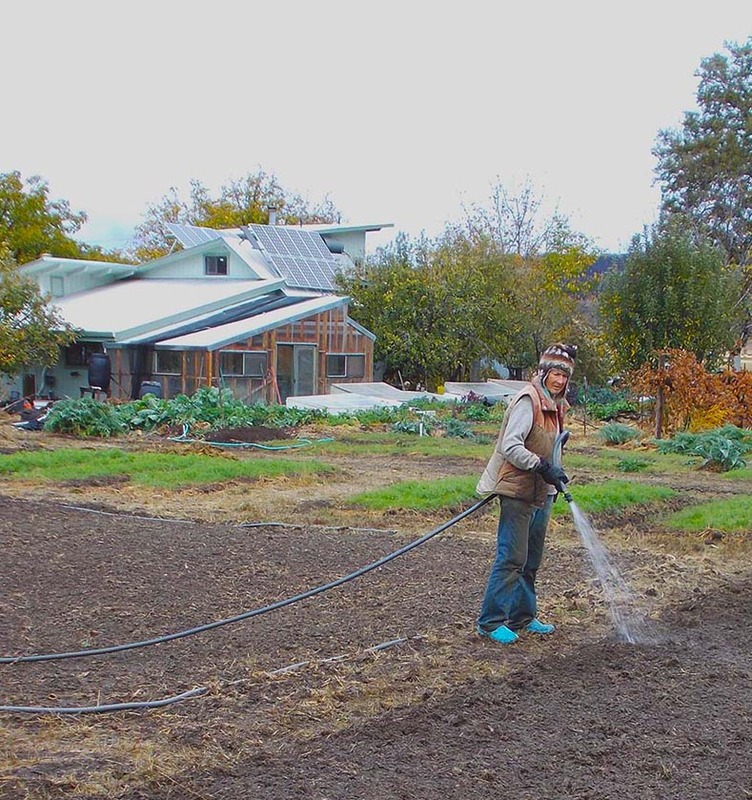 Dandelion host house, Restful Chambers, utilizes a passive solar design, photo voltaic panels, rain catchment for drinking water, and a wood stove/ solar water heater. The main garden and start house are sheltered on the warm south side of the host house. Left: The house on a beautiful day in mid-February. The green house, Chanting Frog, is productive year round. Growing in more controlled indoor conditions has much enhanced our sustainability. We have also added “Plant Lust”, (more greenhouse space) to the side of Chanting Frog, then “Fresh Start”, (a smaller greenhouse areas for starts) to the side of the host house where frost free conditions can be maintained. The start house heats an area of the house when the sun is out and then after dark that heat come back from the house to warm the starts. And lastly, large cold frames have been added to the garden to extend the seasons greatly, and grow greens all winter. Right: This basket of winter bounty was harvested in February. The lemons, tangelos, kale, rhubarb, tomatoes, and flowers were all harvested from the garden and green house in mid-winter. It is surrounded by beds of: mesclun and salad herb mix, bok choy, chinese cabbage, early rapini, parsley, cilantro, arugula, cress, gota kola AND dandelion. With the wonderful addition of green smoothies to our diet, we have researched and grown long lists of usual and unusual greens from around the world for their live nutrients, flavorings and herbal properties. There is always, year around a broad variety of greens growing indoors, outside and in cold frames for the smoothie that has become the one meal we never want to miss. It is so delicious (ultra fresh greens with our own fruits and fruit juices), energizing and health promoting. Greens are food for the future. They grow faster, more abundantly and on less soil fertility than other foods. Asian cultures, since ancient days knew famine and how to survive it. Greens became an important part of the diet out of necessity, with so many health benefits included! One of Dandelion Farm’s goals is to prove that sustainability is not only a necessary and responsible choice but that sustainability can be a beautiful and artistic expression. 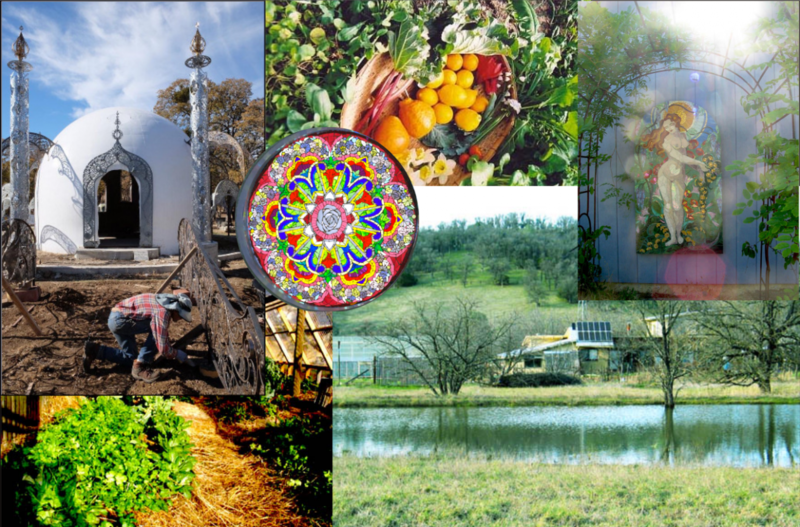 On the farm you will find inspired sculpture, artful natural buildings, and botanical beautification everywhere. We have practiced No Till gardening for 7yrs. under the guidance of Jim Rich. This has greatly improved our growing ability. 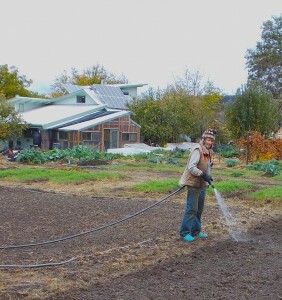 This year with Jim’s stay for a month on Dandelion, we started moving further, establishing large areas and beds devoted to creating “stable humus” in areas not presently needed for food production. This is a simple but momentous farming practice all growers should know about to create sustainable organic fertility, without needing to haul animal manures, mulches or compost….It’s fertility made the way nature does it. Read more in our blog post on Sustainable Fertility. Starting “stable humus” for sustainable fertility. Note start house and cold frames in the background and also beds of stable humus already green and growing. The year round green house provides a constant supply of food. The passive solar heated lap pool + hot tub provides thermal mass for the green house and great recreation!